I have decided to put together a 2014 Travel Guide this year to help all my wonderful followers find great deals on vacation destinations again. This Travel Guide will be similar to the Holiday Guide I do with Joy of Momma Joyner but instead of helping you find great gifts for your family it will help you find wonderful vacation spots. My goal for this Travel Guide is to provide you with some great options that are available and recommended by me for vacation spots and activities this year. I teamed up with some great Resorts and attractions last year on my Travel Guide and I can not wait to bring you more this year. To access the Travel Guide all you need to do is just click on the button on the left side of my blog marked 2014 Travel Guide. There you will be able to see my recommendations for Family Trips, Couple's Trips, Attractions and more. Make sure to check back periodically to see if I have added any new places or activities. 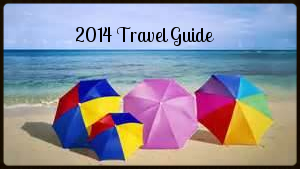 If you would like to be featured in the Andersons Angels 2014 Travel Guide please contact me for further information!